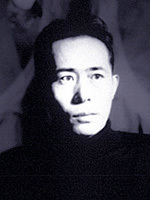 In 1979, Susumu Hirasawa founded the techno-pop group "P-MODEL"
based on the progressive group MANDRAKE. boom at that time, both Y.M.O. and P-MODEL stole the show with their far out sounds. with an ever-regenerating band membership. 1999 was the 20th anniversary of P-MODEL. "MUSICAL INDUSTRIAL WASTES ~ P-MODEL OR DIE"
offering digital music delivered via the INTERNET. PRESENT. This is the nature of HIRASAWA'S WORLD. Since 1994, Hirasawa has staged his own creation "THE INTERACTIVE LIVE SHOW"
using the AMIGA computer and various unique technological instruments. he has staged 5 interactive concerts so far. He now look forwards to bringing the same to the U.S. & Europe. Susumu Hirasawa demonstrates a talent for music. All of his works have touched artists and inspired creators.